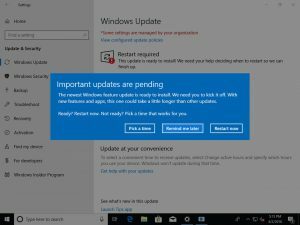 Should You Postpone Windows 10 Updates? First, if you activated Windows 10 less than 30 days before any major update is due to happen, you get a pass; the update will not come to such “young” Windows installations. Presumably, that’s because infant Windows 10 installations are born current. If you need to install Version 1809, use the Media Creation Tool to do an automated re-install of Windows 10; it’s the easiest and most foolproof method. You can find instructions on Microsoft’s Download Windows 10 page. If you have the Home Edition of Windows 10, you cannot postpone major updates. Only users of Windows 10 Pro, Enterprise, and Education Editions are allowed to delay major updates, presumably because their IT departments carry more weight with Microsoft than your family does. However, some Home users might be able to upgrade to Pro for free. See the ZDNet article How to upgrade from Windows 10 Home to Pro for free for details. According to some beta testers of Version 1903, though, there is some relief for Home users who wish to defer updates. On the Windows Update settings page, there is a new option which allows Windows 10 Home Edition users to “Pause updates” for up to 35 days. This won’t help if you’re a Home user wanting to delay the 1903 update, but it will help when the next update rolls around in the Fall. Should you defer major updates if your Edition of Windows 10 permits it? It depends on how well Version 1809 is serving you right now. If you remember, Version 1809 rollout was kind of a nightmare. Some users lost files from their Documents and Pictures folders. Others were having audio problems, or experiencing the Blue Screen of Death. There were also some glitches in the Version 1803 (Spring 2018) update process. Those problems were eventually fixed, but Microsoft was rightly criticized for a lack of quality control. The company says they’ve taken steps to make sure that future updates are fully tested and will roll out smoothly. I don’t feel that any of the new features in the Version 1903 Update (see below) are so important that I must have them as soon as it becomes available. So just to be safe, I will defer the Version 1903 update a few months to give Microsoft time to iron out the inevitable wrinkles. What’s Coming in the Windows 10 Spring Creators Update? You’ll find a “acrylic effect” on the sign-in background. The translucent texture looks cool and moves the controls closer to the password box. The Start menu has a simplified default layout, using a one-column design with reduced top-level tiles. The taskbar will show a “disconnected” icon when there’s not an internet connection (ethernet, wifi, or cellular) on your device. The taskbar notification area includes a new microphone icon which appears when your microphone is in use, shows which app is currently accessing it. Updates to File Explorer include a new taskbar icon, “friendly” file date formats, and an improved Downloads folder which shows the most recently downloaded files at the top. Windows Sandbox is a new feature that used hardware virtualization to safely run untrusted applications in an virtual machine environment without harming your computer. Windows Security includes a new “Protection history” feature that shows information about virus detections, and Tamper Protection for Windows Defender. The list of new features gets a little tedious. If you can live without those goodies few months, you might avoid the pain of a new version’s bugs. 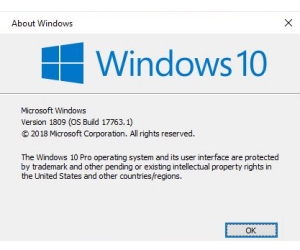 So let’s see exactly how to defer the Windows 10 Version 1903 Update, The following instructions assume you have Version 1809 (Fall 2018 Update) installed. Go to Settings > Update & security > Windows Update, then Advanced options. You will see three options. Option 2 works only on Enterprise, Education, and Pro Editions of Windows 10. It lets you add additional time to the update delay set by Option 1. You can add as many as 365 days, in which case you won’t see any major updates until mid-year, 2020. Option 3 has nothing to do with Spring or Fall feature updates. Instead, it lets you defer important security updates for up to 30 days after their release date. I would pick about one week, giving Microsoft time to fix any bugs while limiting the time my system remains vulnerable. Remember, 99% of the things we worry about never happen. Just be prepared in case they do. This entry was posted in EVENTS, HINTS & TIPS, NEWS, SHOWCASE, VR. Bookmark the permalink.